A couple of weeks ago my wife and I were finishing a walk along the harbor on Balboa Island when we saw bright lights and heard carnival sounds approaching. That gave me enough time to get a shot of the elaborately decorated yacht as it passed by. It was a sight to see: Ferris wheel spinning, carousel turning, roller coaster rolling with all the sound effects. We saw it again during the annual Christmas Boat Parade. Note: The dark areas obscuring the reflected lights at the bottom of the photo are rowboats tied to the dock and the shoreline. Wow! That is sight to see! That is an amazing light display on that yacht, and it has a great reflection. Happy New Year, James. Hope your Christmas was joyful! 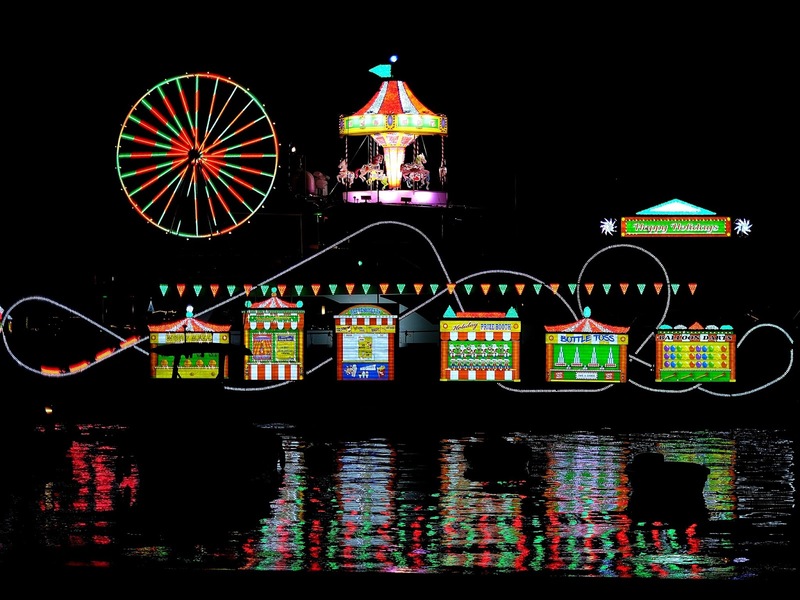 The Christmas Boat Parade is certainly a spectacle! And wishing you pleasant surprises and successful new things in Southern Calif. in 2019! That must be a pretty sight, as are your pictures. I have never seen a carnival activity on a boat. HAPPY NEW YEAR to you and to you all. Wow! That's quite a yacht! What a colourful reflection shot James. Thank you for hosting and also linking me in while I was away in Cape Town. I am just back with thousands of photographs which I now have to edit! I hope that 2019 will bee a a happy and healthy one for you and your family. WOW! Seeing that must be AWESOME!!!... :)JP HAPPY NEW YEAR! bonne et heureuse année 2019 ! merci pour ce nouveau reflet plein de couleur !